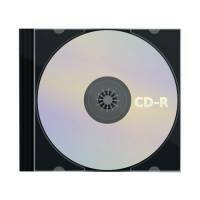 CD-R Slimline Jewel Case 80min 52x 700MB WX14157 Pack of 1 CD-R Slim Jewel Case 80min 52x 700MB. Multi-speed recordable CD. 80 minutes 700MB. In slimline jewel case. Up to 4x recording speed. 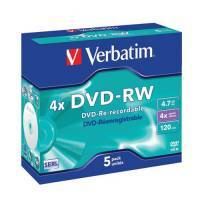 Verbatim 4.7GB 4x Speed Jewel Case DVD+RW (Pack of 5) 43246 Pack of 1 "Verbatim DVD-R matt silver. Matt surface can be written on with a CD/DVD marker pen. Perfect for sharing computer data, home videos, photos and music. Capacity: 4.7GB. Speed: 16x. Pack of 5 in jewel cases." 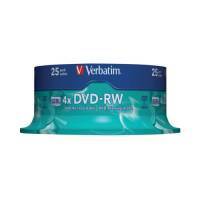 Verbatim 4.7GB 4x Speed Jewel Case DVD-RW (Pack of 10) 43285 Pack of 1 "DVD-R wide inkjet printable ID brand. White surface for inkjet printing up to the hub. Print area: 21 - 118mm. Perfect for sharing computer data, home videos, photos and music. Capacity: 4.7GB. Speed: 16x. Pack of 10 jewel cases." 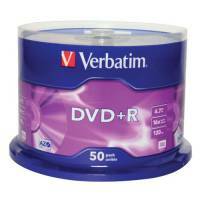 Verbatim 4.7GB 16x Speed Spindle DVD-R (Pack of 50) 43500 Pack of 1 "Verbatim DVD-R matt silver. Matt surface can be written on with a CD/DVD marker pen. Perfect for sharing computer data, home videos, photos and music. Capacity: 4.7GB. Speed: 16x. Spindle of 50." 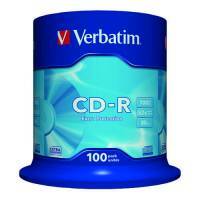 Verbatim CD-R 700MB/80minutes 52X Spindle (Pack of 50) 43351 Pack of 1 "Verbatim CD-R extra protection. Up to 100 years archival life. White surface provides extra protection for the vulnerable label side. Can be written on. Perfect for computer data, home videos, photos and music. Capacity: 700MB. Speed: 52x. Spindle of 50." Verbatim DVD-RW Discs 4X 4.7GB (Spindle of 10) 43552 Pack of 1 "4x speed DVD-RW with 4.7GB capacity. Recordable: write, erase and re-write repeatedly. Label surface for adding a title. 4x write speed: write a full DVD in minutes. Secure, highly compatible discs that can last up to 100 years." 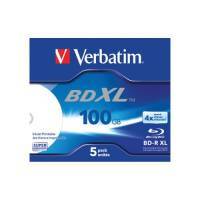 Verbatim Blu-ray BD-R 25 GB 6x Printable Spindle (Pack of 50) 43812 Pack of 1 Blu-Ray perfect for HD video. Speed: 6x. Surface suitable for inkjet printing. Cakebox for space saving storage. Supplied in a pack of 50. Capacity: 25GB. 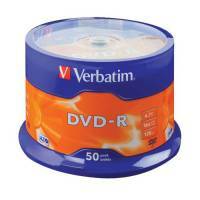 Verbatim CD-R Datalife Non-AZO 80minutes 700MB 52X Non-Printable Spindle (Pack of 25) 43432 Pack of 1 Verbatim 43437 CD-R extra protection. White surface provides extra protection for the vulnerable label side. Can be written on with a CD/DVD marker pen. Capacity: 700MB. Speed: 52x. Spindle of 25. 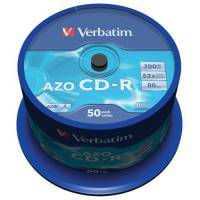 Verbatim CD-R Datalife Non-AZO 80minutes 700MB 52X Non-Printable Spindle (Pack of 10) 43437 Pack of 1 Verbatim 43437 CD-R extra protection. White surface provides extra protection for the vulnerable label side. Can be written on with a CD/DVD marker pen. Capacity: 700MB. Speed: 52x. Spindle of 10. Verbatim CD-RW Datalife Plus 80minutes 8-12X Hi-Speed Spindle (Pack of 10) 43480 Pack of 1 "Verbatim CD-RW. Rewritable disc that can be overwritten at least 1,000 times. White surface provides extra protection for the vulnerable label side. Capacity: 700MB. Speed: 12x. Spindle of 10." 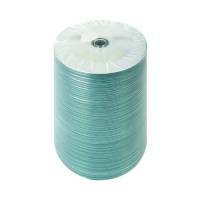 Verbatim DVD+RW Silver Non-Printable Spindle (Pack of 10) 43488 Pack of 1 Verbatim 43488 DVD+RW matt silver. Capacity 4.7GB. Speed 4x. Can be overwritten 1000 times. 10 pack spindle. 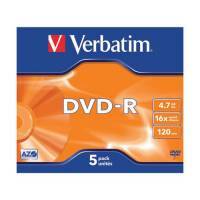 Verbatim 4.7GB 4x Speed Jewel Case DVD-RW (Pack of 10) 43486 Pack of 1 "Verbatim DVD-R matt silver. Matt surface can be written on with a CD/DVD marker pen. Perfect for sharing computer data, home videos, photos and music. Capacity: 4.7GB. Speed: 16x. Spindle of 10." 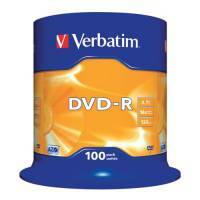 Verbatim DVD-R 16x Non-Printable Spindle (Pack of 100) 43549 Pack of 1 "Verbatim DVD-R matt silver. Matt surface can be written on with a CD/DVD marker pen. Perfect for sharing computer data, home videos, photos and music. Capacity: 4.7GB. Speed: 16x. Spindle of 100." 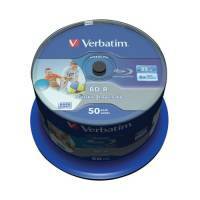 Verbatim DVD+R 16X Non-Printable Spindle (Pack of 50) 43550 Pack of 1 "Verbatim DVD+R matt silver. Matt surface can be written on with a CD/DVD marker pen. Perfect for sharing computer data, home videos, photos and music. Capacity: 4.7GB. Speed: 16x. Spindle of 50." 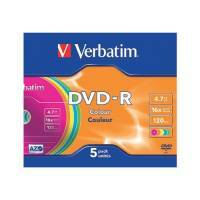 Verbatim 4.7GB Printable Jewel Case DVD-R (Pack of 5) 43521 Pack of 1 "Verbatim DVD-R colour. Different colours provide options for categorisation. Can be written on with a CD/DVD marker pen. Perfect for sharing computer data, home videos, photos and music. Capacity: 4.7GB. Speed: 16x. Pack of 5 jewel cases." 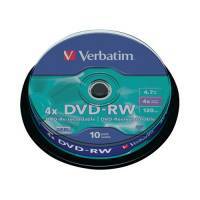 Verbatim DVD-RW 4X Silver Non-Printable Spindle (Pack of 25) 43639 Pack of 1 "Verbatim DVD-RW matt silver. Matt surface can be written on with a CD/DVD marker pen. Perfect for sharing computer data, home videos, photos and music. Capacity: 4.7GB. Speed: 4x. Spindle of 25." 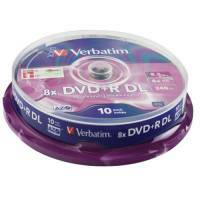 Verbatim 4.7GB 16x Speed Jewel Case DVD+R (Pack of 100) 43519 Pack of 1 "Verbatim DVD+R matt silver. Matt surface can be written on with a CD/DVD marker pen. Perfect for sharing computer data, home videos, photos and music. Capacity: 4.7GB. Speed: 16x. Spindle of 100." Verbatim DVD+R 8X Double Layer Non-Printable Spindle (Pack of 10) 43666 Pack of 1 "Verbatim DVD+R double layer matt silver discs. Matt surface can be written on with a CD/DVD marker pen. Perfect for sharing computer data, home videos, photos and music. Capacity: 8.5GB. Speed: 8x. Spindle of 10." 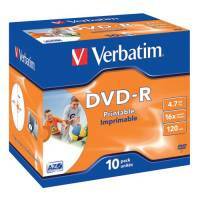 Verbatim DVD-RW 4X 4.7GB (Pack of 5) 43285 Pack of 1 "Verbatim DVD-RW matt silver re-recordable discs. Matt surface can be written on with a CD/DVD marker pen. Perfect for sharing computer data, home videos, photos and music. Capacity: 4.7GB. Speed: 4x. Pack of 5 in jewel cases." Verbatim CD-R 700MB 80minutes Spindle (Pack of 50) 43343 Pack of 1 "Verbatim CD-R AZO Crystal. Up to 100 years archival life. Crystal clear lacquer surface to provide extra hard protection. Can be written on. Perfect for sharing computer data, home videos, photos and music. Capacity: 700MB. Speed: 52x. Spindle of 50."